After completing higher secondary from Mirzapur Cadet College, Subrata Kumar Saha joined Marine academy Chittagong in 1990 in 26th batch. After successful completion of two years pre-sea training, he joined Orient Ship Management Hongkong as deck cadet in 1992. His training was completed in various specialized ships like Timber carrier and in OBO. He started his career as deck officer in Dilmun Shipping, a British owned chemical tanker fleet. Both Oil and Chemical were the products carried by the fleet. There he worked until 2001. He is one of the pioneer Bangladeshi officer, joined in chemical fleet. Then he joined UNIX Line, Singapore, one of the biggest chemical tanker fleet in the world, as additional Chief Officer. He worked in Unix Line with great devotion and gradually was promoted to Master. He has vast experience of handling different grades of oil/chemical cargoes. He has total18 years of sea experience out of which almost 15 years in chemical tankers. He has done On Job training(OJT) in Unix Line Office in Singapore. There he acted as boarding superintendent and visited ships, observed various critical cargo related activities like loading, unloading and tank cleaning. He also has experience of taking over new vessel from shipyard. 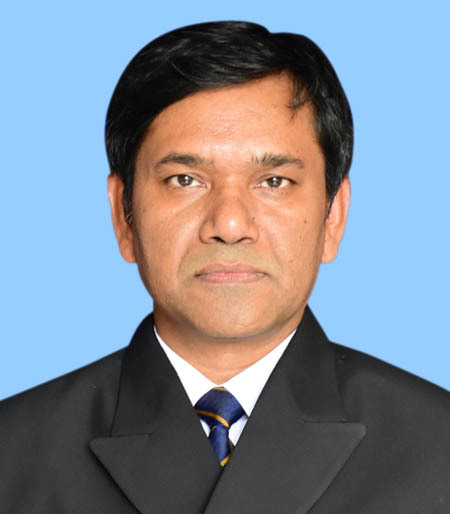 Having keen interest in teaching, he started his career as nautical instructor in private marine academies in Bangladesh. He Joined International Marine Academy in 2015 as Nautical Instructor and has a vision to share his tanker experience with the next generation of tanker seafarers. He is permanently residing in uttara with his family. He is blessed with two daughters.